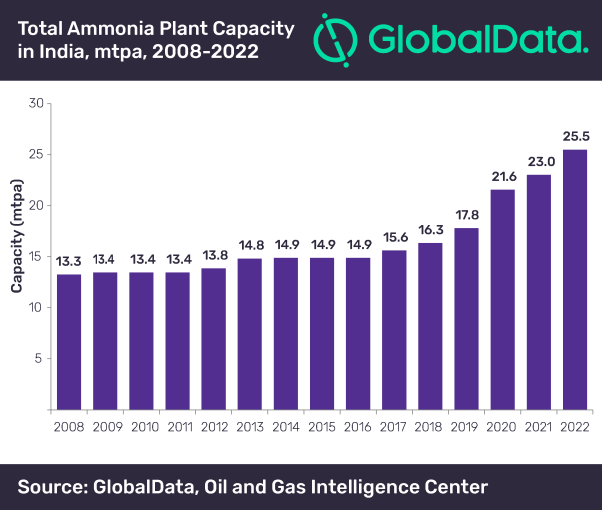 India’s ammonia plant capacity is forecasted to grow at a compound annual growth rate (CAGR) of 10.3% from 15.610 million tonnes per annum (mtpa) in 2017 to 25.491 mtpa in 2022, according to GlobalData, a leading data and analytics company. The company’s report: ‘Ammonia Industry Outlook in India to 2022 – Market Size, Company Share, Price Trends, Capacity Forecasts of All Active and Planned Plants’ reveals that 17 upcoming projects are expected to commence their production by 2022. Some of the major projects are–Indian Farmers Fertiliser Cooperative Kalol Ammonia Plant 2, Nagarjuna Fertilizers and Chemicals Kakinada Ammonia Plant 3 and Hindustan Urvarak & Rasayan Sindri Complex Ammonia Plant 2. The largest ammonia plants in India in 2017 were Matix Fertilisers & Chemicals Panagarh Ammonia Plant, Jaypee Fertilizers & Industries Kanpur Ammonia Plant, Yara International Babrala Ammonia Plant, Indo Gulf Fertilizers & Chemicals Corporation Jagdishpur Ammonia Plant and KRIBHCO Hazira Ammonia Plant 1. Indian Farmers Fertilisers Coop Ltd, National Fertilizers Ltd, Krishak Bharati Co-operative Ltd, Rashtriya Chemicals and Fertilizers Ltd, and Chambal Fertilisers and Chemicals Ltd together accounted for 58.3% of the ammonia capacity in India in 2017. In India, the main segments that consume ammonia are Urea and Ammonium Phosphate. In 2017, these segments accounted for almost 93.8% of the ammonia demand in the country. The average price of ammonia in India is expected to increase at a CAGR of 3.9% from $296.9/ton in 2017 to $359.0/ton in 2022. During 2008 to 2017, India has been a net importer of ammonia. According to GlobalData’s outlook, it is expected to continue on similar trend with imports being higher than exports until 2022. Imports as percentage of demand in the year 2008 was 9.6%. According to a GlobalData forecast, imports as percentage of demand is expected to decrease from 15.8% in 2017 to 8.1% in 2022.